The Oakley Radar EV Path Prizm Road has become my preferred set of cycling glasses for almost all weather conditions. Having used mostly Oakley M-Frame models as of the early 1990’s this Oakley Radar EV version made me smile, providing a better view than the original Oakley Radar. I will briefly look at the design, and share my thoughts on the Prizm Road lens that perfectly complements this high quality glasses. As a huge fan of the clear vision with the Oakley M-Frame I disliked the original Oakley Radar for the bar blocking my vision in certain head angles. So when I friend of mine bought the Oakley Radar EV (and could compare with the Oakley Radar) I was sold. Not just the M-Frame like excellent quality feeling, but also the Prizm Road lens made me smile. The Path lens-shape matches closest to the Oakley M-Frame Sweep lenses. The grip of the nose pad and the long ear pads on the Radar’s arms are excellent, especially when sweating the glasses keep in place. The Oakley Radar EV is comfortable to wear, also on long 100+ km rides. With my Oakley M-Frame I bought a couple of Sweep lenses over the years from clear, to contrast enhancing lenses persimmon, VR28 and sun-blocking grey- to gold iridium lenses. With the Oakley Radar EV Prizm Road I just have one lens, that is perfectly suitable for almost all weather conditions. From sunny days to cloudy days, I just use the Prizm Road lens … despite the fact that there are a lot of replacement lenses available. It is a perfect balance of sun-blocking and contrast enhancing capabilities. I have been a huge fan of the Oakley M-frame range as of the first M-frame version that I bought in the early 1990’s. And please check out the cool article “Oakley M-frames through the ages“. However after the Oakley Pro-M-Frame the original Oakley Radar couldn’t convince me. The Oakley Radar Path EV has again this wow-factor, is comfortable to wear with excellent vision. The Prizm Road lens is the only lens I use and has me covered in almost all circumstances. You will get a Oakley Radar EV with Prizm Road lens for a price-point of about EUR 130,–. In my opinion worth every cent given the high quality product you get, and I currently own a black and a white Oakley Radar EV both equipped with a Prizm Road lens. Both Oakley Radar EV Path come with a Sport Soft Vault Case, a micro bag to clean the lenses and an extra nose-pad. So all in all a complete set for a good price-point. What glasses do you use for cycling ? Hey!, I found this information for you: "Oakley Radar EV Path Prizm Road". 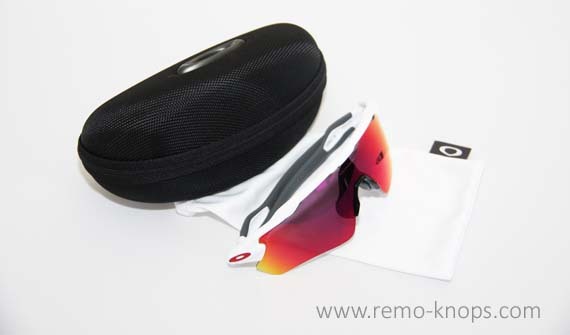 Here is the website link: https://www.remo-knops.com/6115/oakley-radar-ev-path-prizm-road/. Thank you.